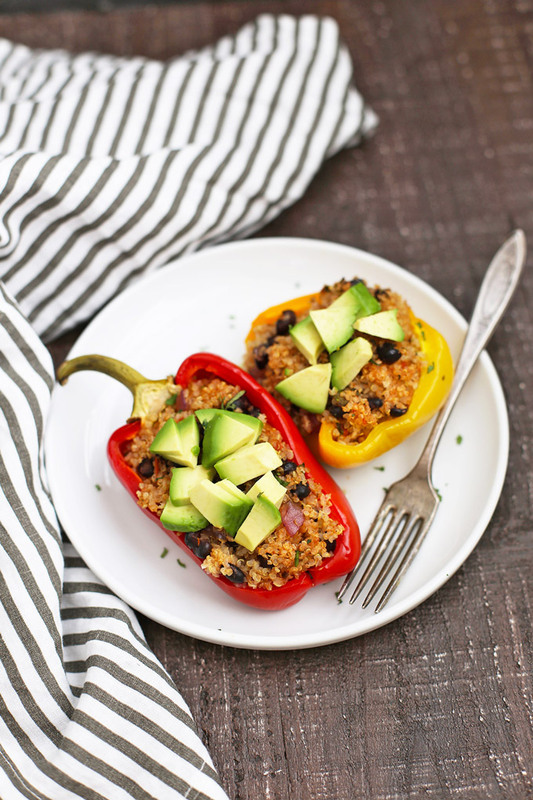 Taco Quinoa Stuffed Peppers – These vegan stuffed peppers have an amazing quinoa filling with a taco twist. So much flavor, so very good for you. This post is written in partnership with Sprouts Farmers Market. All opinions are my own. So to break things up, I’ve been going back to cozy comfort food classics. Naturally, I give them a lightened up/nutrient-boosted twist because there are few things I love like comfort food that loves me right back. These stuffed peppers felt exactly right. Warm and comforting, loaded with goodies, and ready for us to tuck in. They also come with a lot of options for changing them up AND a really fun way to make them for Halloween. A lot of stuffed peppers use rice as a base. We eat a LOT of rice as a gluten free family, so I love subbing in quinoa now and again to change things up. I mixed in some easy Tex-Mex flavors (a few veggies, some black beans, fresh herbs, and warm seasonings). Then, to tie everything together, I spooned in a bit of salsa. I gave everything a stir and loaded those peppers till they wouldn’t hold any more! 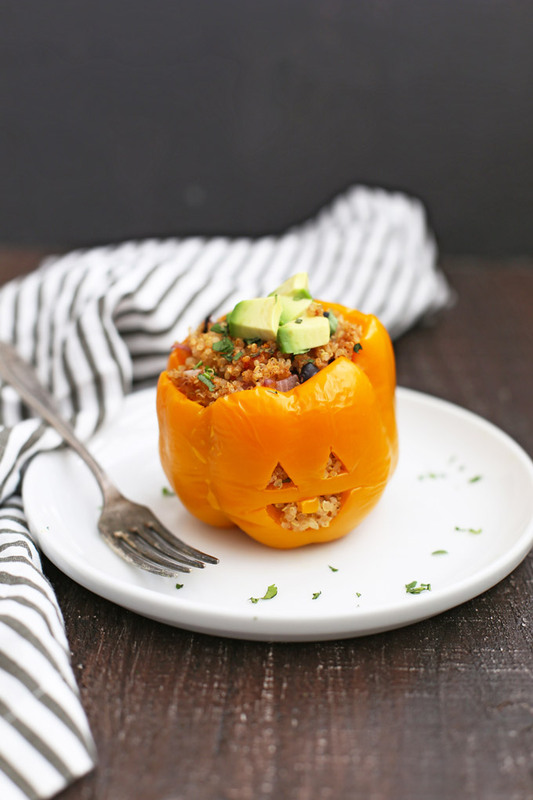 I typically do my stuffed peppers by slicing them in half lengthwise, but for a fun and festive Halloween twist, I wanted to show you an easy way to turn them into Jack ‘O’ Lanterns. It’s easy! Instead of halving them, I simply cut off the top (like I would a pumpkin), remove the seeds and membranes, then use a sharp knife to cut out some eyes, a nose, and a mouth. Done! They’re a bit larger per person, but they look like adorable little Jack ‘O’ Lanterns! 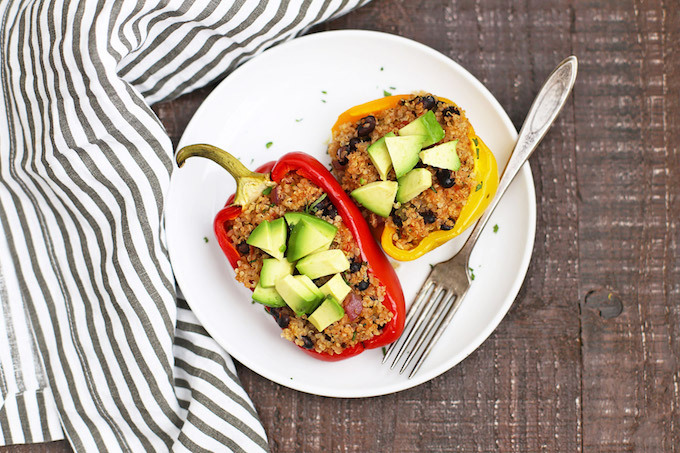 Whether you make them the “regular” way or carve up some bell pepper Jack ‘O’ Lanterns, these taco quinoa stuffed peppers are the perfect healthy comfort food! A Tip on Peppers – One thing I don’t love about stuffed peppers is when the pepper never really gets soft. You can speed things along by microwaving the peppers for a minute or two before stuffing them. I prefer to add a little water to my baking dish, which helps them steam and soften without burning. Change Them Up! Feel free to get creative with your add-ins here. Stir in some corn, some green chiles, or even a little taco beef, chorizo, or cheese (if you’re not eating meatless). Another easy way to change the flavor is by swapping out your salsa. Try using salsa verde, chipotle salsa, or even something with a sweet note, like mango salsa! Sprouts carries a LOT of yummy flavors (their tomatillo salsa is one of my all-time favorites). Make-Ahead Tips. You can prepare these as a freezer meal by stuffing and freezing the peppers before baking. Stuff the peppers, freeze until solid, then transfer to a zip-top bag or freeze directly in an oven-safe container. Cook straight from the freezer, adding an extra 8-10 minutes or so to the cook time. What to Serve With Them. Since this is pretty warm and filling, we serve them with a light salad or this Honey Lime Fruit Salad (swap out the honey for agave for a vegan option!). Prepare a baking dish (8×8 if you’re doing them as Jack O’Lanterns or 9×13″ if you’re halving them) by filling it with 1/2″ water. In a large bowl, stir together quinoa, black beans, salsa, red onion, lime juice, cilantro, cumin, chili powder, and a pinch of salt. 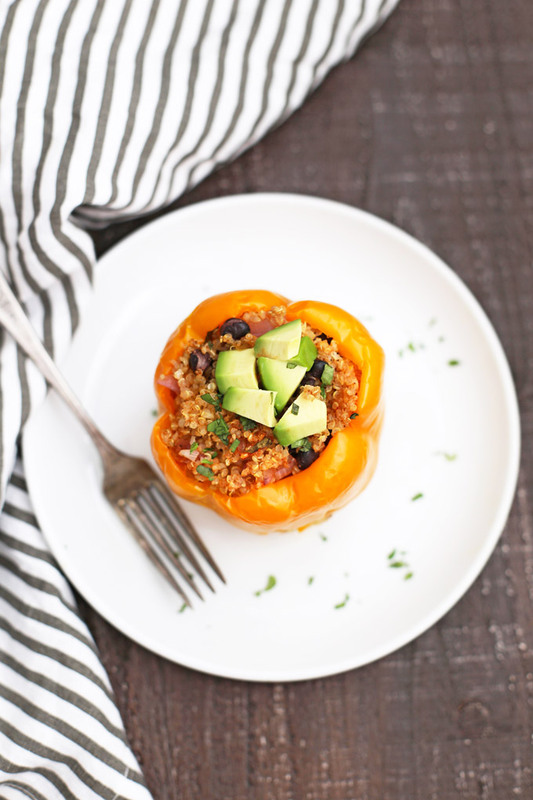 Scoop quinoa filling into peppers or pepper halves. Carefully place in your baking dish. Cover dish with foil. Bake 40-50 minutes, or until peppers are your desired tenderness. Enjoy with additional salsa, avocado, or your favorite taco toppings! CUTTING YOUR PEPPERS: I typically halve my peppers lengthwise (stem to bottom) and remove the seeds and membranes before stuffing. To turn them into Jack ‘O’ Lanterns, I simply cut off the top (like I would a pumpkin), remove the seeds and membranes, then use a sharp knife to cut out some eyes, a nose, and a mouth. Done! I’ve always loved stuffed peppers, and these look extra healthy. Your “tips on peppers” are really helpful. Thanks! Hi Emily, These look so fun and delicious! How long do you typically cook them for? (I wasn’t sure if I missed the instructions in the recipe?) I love the Jack-o-lantern idea! 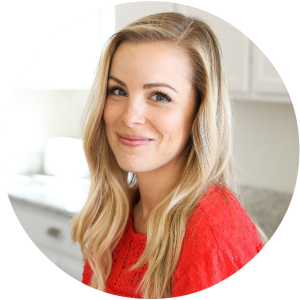 Allison – I’m SO thankful for your comment! Somehow, my recipe instructions were deleted from the recipe card and I had no idea! I’ve corrected it now. I typically bake them between 40-50 minutes. They get tender and delicious!